Open EditProducts.ascx.vb. In the region “Private Members” the class variable ItemId is declared. This is where we store the ID of the product item to edit. Now we have the product item ID in the ItemId variable, if supplied. If there was no ItemId parameter in the query string this means that we should create a new item instead of editing an existing one. This only has to be done the first time the page is loaded so we wrap it in a check for IsPostBack. In the case when an ItemId is supplied we add some client script to get a confirmation when deleting an item. 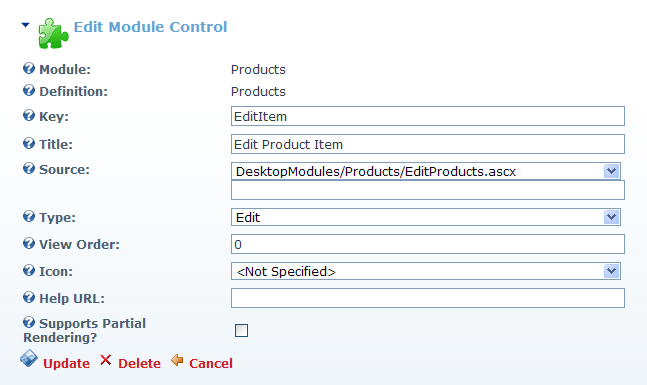 Then we fetch the product item with the current module ID and item ID as keys and populate the controls. If there is no matching item, something must be wrong. In that case we redirect the heck out of there, back to the view page. When an ItemId is not supplied, this means we should create a new item. Just hide the Delete button. The error handling code displays an error message to the user, which is enough for us right now. Go through all three of the Click event handlers and make sure they are marked as Protected and not Private. Next in line is the implementation of cmdUpdate_Click. Basically we check if we got an ItemId or not and thereby decide if we should update an existing item or create a new one. One thing to note about the code above is how we pull the content from the Description TextEditor control. If you use Description.Text you will get the HTML encoded content (“<” is converted to “&lt;” and so on) which is not what you want in this case. Use Description.RichText.Text and you will get the raw markup. With that done, compile the project to make sure everything is ok. Then log in as host in your DotNetNuke website. Now we’re going to add our brand new edit control to the Products module. Go to Host > Module Definitions. Locate the Products row in the list and click the edit icon. Scroll down to the section Module Controls and click Add Module Control. Now we can at last create product items and edit them. Great! Try it out! Go to the page where you added the Products module. Make sure you are in edit mode. Now click the Add Content link. This time it actually happens something interesting. You should now see the edit control with a text field for product name and a text editor for description. Enter some text in them and click Update. The product you just added should now appear in the product list. Now click the edit (pencil) icon next to the product name. This will take you to the edit screen and let you edit the product item. Play around with your nice new controls until next time, when we look at the settings control. As long as you carefully followed the tutorial (especially part 2) you shouldn't have missed anything. I think you get the error because the VS designer fails to declare the Description control with the correct type (should be Global.DotNetNuke.UI.UserControls.TextEditor). Please let my know how it goes. Thank you so much!! for the tip that worked and for this wondeful tutorial! and did what you described. But it doesnt solve the Error. For some reason, when I open DotNetNuke website's login screen, I don't see the textboxes, just the login image (the lock). I click on the Register link and I was able to go the User Registration page, but still can't see any textboxes or any controls. I tried resetting IIS, uninstalled DNN and installed it again (worked for a while but happened again later on). That was very weird indeed! Sorry to say, I have absolutely no clue what would cause that kind of behavior. When you find the source of the problem you are very welcome to share what it was. I'm really curious! Best of luck in tracking it down. Ok, finally got it to work again after numerous installs. Apparently if you have the DesktopModules folder setup as a Virtual Directory in IIS, that makes DotNetNuke not find any module needed to be loaded. The reason why I had it setup as a Virtual Directory is to be able to test and debug in Visual Studio but apparently that causes some major issues. Removing the Virtual Directory from IIS fixed the problem. I just thought I would share my findings just in case someone faced a similar situation. Glad to hear that you sorted it out. I'm getting the following error when I add If Not Null.IsNull(ItemId).... in Page_Load method in EditProducts.ascx.vb. 'Null' is not declared. 'Null' constant is no longer supported; use 'System.DBNull' instead.